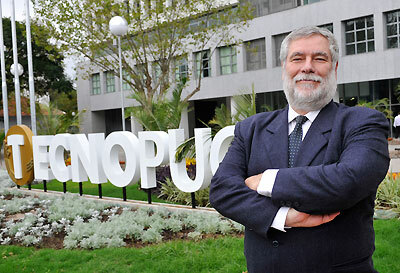 The establishment of the INOVAPUCRS Network – PUCRS innovation system – was the University’s best initiative in Innovation. Much more than a park, we built a system of agents that explore, positively, the Triple Helix (university, industry and government). The Network for Innovation and Entrepreneurship at the Pontifical Catholic University of Rio Grande do Sul (INOVAPUCRS) brings together a set of actors, actions and mechanisms for promoting PUCRS’ innovations and entrepreneurship processes. To do so, it seeks to articulate all the ones involved in the triad education, research and extension to community. The focus of the work of the University, through INOVAPUCRS, is the promotion of multidisciplinary efforts in finding solutions for society’s demands in terms of economic, social, environmental and cultural development. Thus, the relationship between university and society occurs in two ways: identifying the demands in society which should give rise to the development of research, as well as applying the knowledge available at the university, generated by research aiming at the solution of existing problems. INOVAPUCRS promotes the interaction and relationship between actors of the Academic Centre and the Peripheral Units of the University. The Peripheral Units are institutional mechanisms focussed on the interaction with society, more specifically, with companies and different government sectors. The Academic Centre is composed of the Academic Units, Research Institutes and the research area of the Science and Technology Museum, where scientific and technology research takes place. The results of the research may be transferred to society and to the university itself. We attribute this initiative’s success to teamwork and strong leadership. The shortness of breath to embrace all projects those successful initiatives have brought is one of our future challenges. Esse post foi publicado em English, Suite e marcado Edition 28 - September 2013 por Wenovate. Guardar link permanente.